Our attraction to light is hard-wired deep into the most primitive corners of the human mind and psyche. Until Mr. Edison’s relatively recent invention, candles, torches, and open fires were the only way to turn back the dark night. It is easy to forget how easy most of us have it in today in contrast to just a few generations ago. Recent satellite images of the planet reveal just how much of the earth is lit up every night with clusters of the American east and west coastal cities merging into each other, even revealing the land’s natural geography using only light. From six miles in the sky on a nighttime airplane trip across the country, white and amber threads reveal highways connecting and crossing white dots, parking lots, familiar golden arches, and baseball fields. Flying much past the Mississippi River and giant swaths of black emptiness, punctuated on occasion by a malls or small town, convey the fact that much of the flyover belly of the United States is empty and remote, as dark and primitive and beautiful as it always has been. Traveling provides great contrasts and often in proximity. On a recent trip across historic Route 66 in the American southwest, we drove late in the day on a section of the Mother Road heading west between Kingman, Arizona and Needles, California. As the road winded west, fewer towns, greater distances between them, combined with more dramatic geography, setting the stage for a memorable ride. As the seldom-used road climbs, then falls steeply just before entering the sleepy mining, now tourist town of Oatman, the journey becomes a series of hairpin curves, guardrail-less drop-offs and white knuckle steering. There is a reason this part of Route 66 fails to show up on our rental car’s GPS nor is the AAA’s suggested travel route to California. The deep shadows on the canyon walls, the sun’s mesmerizing afterglow, and dozens of sharp and blind curves, make driving off a cliff a distinct possibility in this part of the world. Lucky for us, we made it to Oatman before darkness. The town is the home to wild, free-roaming burros and a supposedly haunted Oatman Hotel, once fabled to have been the honeymoon hideout of movie stars Clark Gable and Carole Lombard in 1939. As places like Oatman became nonessential with faster and safer interstate routes and our collective angst over not wasting a minute in the day, clever marketing, promises of kitschy gifts and free wi-fi, plus stories of ghosts and movie stars are the only pull places like this have for most travelers. 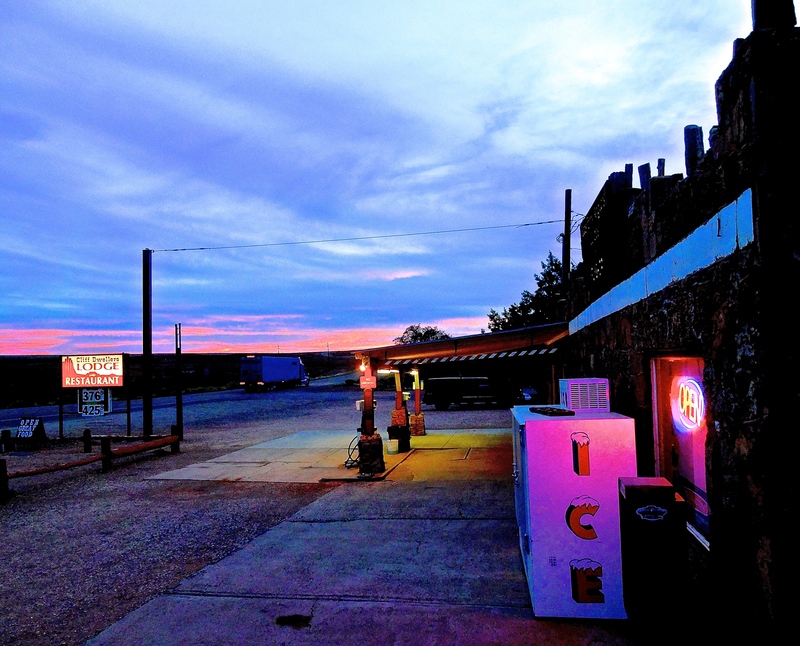 Neon lights up the desert night at Moab’s Apache Motel. By the time we made it through Oatman and headed down the mountain pass toward Needles, the only visible light in any direction was coming off our headlights ahead and the stars in the sky. Sadly, there are few places left like Oatman, but it is well worth a few hours of any cross-country trek. Just a few hours away from the absolute black of the night desert and the lonely stretch of two lane highways is the very opposite of Oatman: Las Vegas. Venturing here just after sundown, the glow from the city is unmistakable from any direction. Driving or walking up and down the dazzling Las Vegas Strip, or looking down from any of the landmark hotels is a feast for the eyes. Millions of watts of energy, many produced by what’s left of the water coursing through the nearby Colorado River and its hydroelectric dams, go into producing staggeringly bright, beautiful towering pillars of man’s ingenuity and vanity. Millions of people from around the globe descend on “Sin City’ each year to feast their senses and lighten their wallets in the Mecca of illusion, gaming and chance. Paris is no longer the only city of light, with Las Vegas building its own version of the Eiffel Tower, and the Louvre, along side a Venetian canal, a Roman villa, a nonstop circus, and a glass pyramid of Luxor. 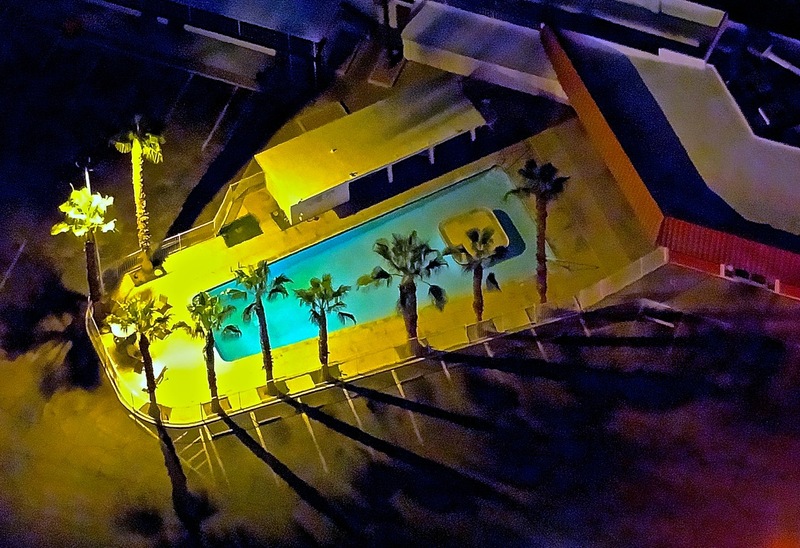 From high above, a swimming pool at night in Las Vegas, glows under the sodium lights. All of history before the late nineteenth century was for the most part blanketed in darkness and cold from sundown to sunup. 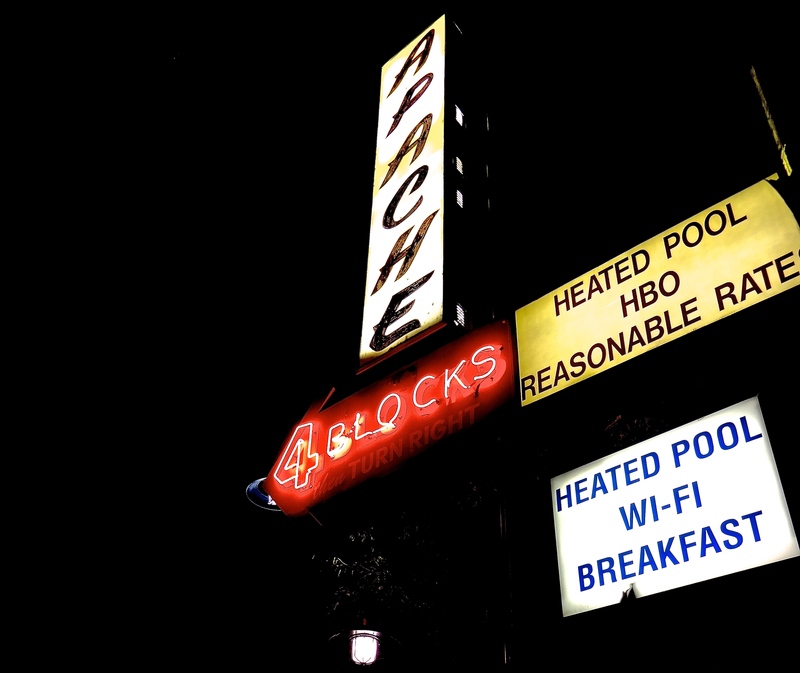 The siren call of glowing city lights, the moving images of electronic billboards to the cozy flicker of neon signs of road houses and motels along remote two lane roads, all invite and tease us to draw nearer and settle in for the long night ahead. 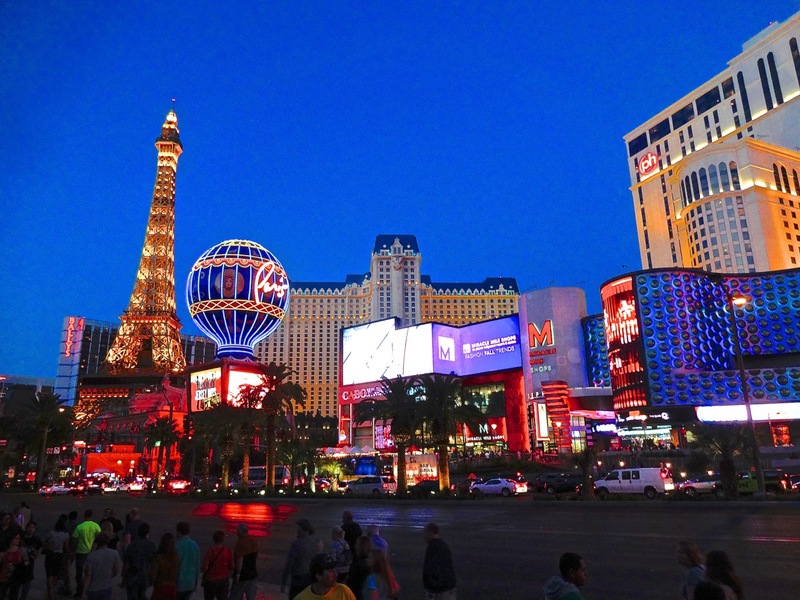 The splendors of Paris share just a city block in the condensed version along the Las Vegas strip.